* Chianthemum nivale (L.) Kuntze, Revis. Gen. Pl. 2: 703 (1891). * Galanthus nivalis var. majus Ten., Fl. Napol. 1: 140 (1811). * Galanthus nivalis var. minus Ten., Fl. Napol. 1: 140 (1811). * Galanthus imperati Bertol., Fl. Ital. 4: 5 (1839). * Galanthus montanus Schur, Enum. Pl. Transsilv. : 658 (1866). * Galanthus nivalis var. scharlockii Casp., Schriften Königl. Phys.-Ökon. Ges. Königsberg 8(Schutzungsb. ): 18 (1868). * Galanthus scharlokii (Casp.) Baker, Handb. Amaryll. : 17 (1888). * Galanthus umbricus Dammann, Cat. 1889: 4 (1889). * Galanthus nivalis subsp. imperati (Bertol.) K.Richt., Pl. Eur. 1: 234 (1890). * Galanthus nivalis var. hololeuca Celak., Abh. Königl. Böhm. Ges. Wiss., VII, 3: 198 (1891). * Galanthus alexandri Porcius, Analele Acad. Române 14: 274 (1893). * Galanthus melvillei Voss, Vilm. Blumengärtn. ed. 3, 1: 1006 (1895). * Galanthus nivalis f. pictus K.Malý, Verh. K. K. Zool.-Bot. Ges. Wien 54: 302 (1904). * Galanthus nivalis var. atkinsii Mallett, Garden (London 1871-1927) 67: 87 (1905). * Galanthus nivalis var. carpaticus S.S.Fodor, Ukrayins'k. Bot. Zhurn. 40(5): 32 (1983), exact type not cited. * Galanthus nivalis f. pleniflorus P.D.Sell in P.D.Sell et G.Murrell, Fl. Great Britain Ireland 5: 363 (1996). * Royal Botanic Gardens, Kew: G. nivalis. 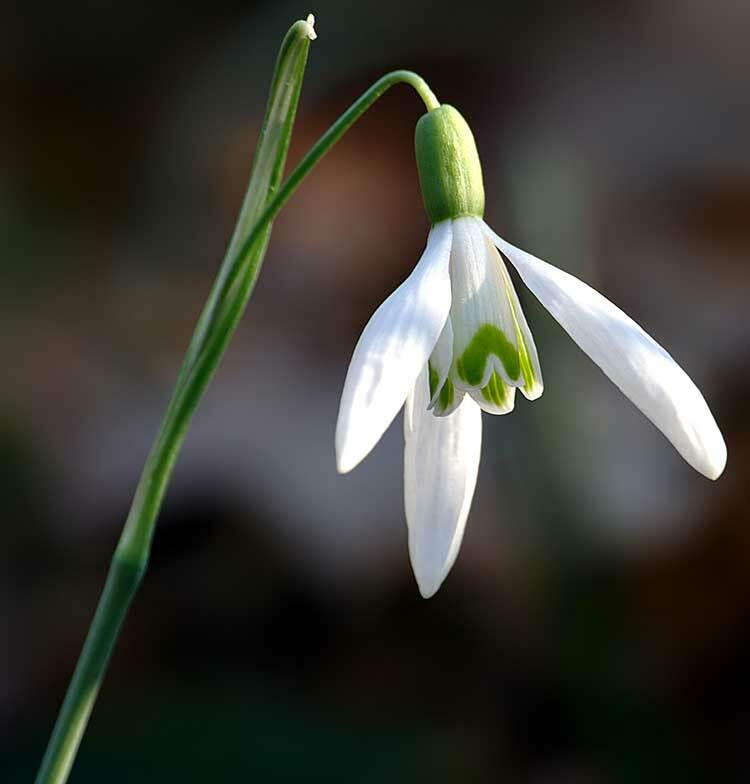 Often referred to as the common snowdrop, Galanthus nivalis is the best-known and most widespread representative of a small genus of about 20 species in the family Amaryllidaceae. Snowdrops are among the first bulbs to bloom in spring and can form impressive carpets of white in areas where they are native or have been naturalised. The generic name Galanthus, from the Greek gala (milk) and anthos (flower), was given to the genus by Carl Linnaeus in 1735. He described Galanthus nivalis in his Species Plantarum published in 1753. The epithet "nivalis" means "of the snow", referring either to the snow-like flower or the plant's early flowering. The common name snowdrop first appeared in the 1633 edition of John Gerard's Great Herbal (in the first edition (1597) he described it as the "Timely flowring Bulbus violet"). The derivation of the name is uncertain, although it may have come from the German word Schneetropfen, which was a type of earring popular around that time. Other British traditional common names include "February fairmaids", "dingle-dangle", "Candlemas bells", "Mary's tapers" and, in parts of Yorkshire,"snow piercers" (like the French name perce-neige). Galanthus nivalis is widely grown in gardens, particularly in northern Europe, and is widely naturalised in woodlands in the regions where it is grown. It is, however, native to a large area of Europe, from Spain in the west, eastwards to the Ukraine. It is found in Albania, Austria, Bulgaria, the Czech Republic, France, Georgia, Germany, Greece, Hungary, Italy, Poland, Moldova, Romania, Slovakia, Spain, Switzerland, Turkey, Ukraine and the former Yugoslavia. Although often thought of as a British native wild flower, or to have been brought to the British Isles by the Romans, it is now thought that it was probably introduced much later, perhaps around the early sixteenth century. Galanthus nivalis grows to around 7–15 cm tall, flowering between January and April in the northern temperate zone (January–May in the wild). They are perennial, herbaceous plants which grow from bulbs. Each bulb generally produces two linear, or very narrowly lanceolate, greyish-green leaves and an erect, leafless scape (flowering stalk), which bears at the top a pair of bract-like spathe valves joined by a papery membrane. From between them emerges a solitary, pendulous, bell-shaped white flower, held on a slender pedicel. The flower consists of six tepals, also referred to as segments. The outer three are larger and more convex than the inner ones. The inner flower segments are usually marked on their outer surface with a green, or greenish-yellow, V or U-shaped mark (sometimes described as "bridge-shaped") over the small "sinus" (notch) at the tip of each tepal. The inner surface has a faint green mark covering all or most of it. Occasionally plants are found with green markings on the outer surface of the outer tepals. The six long, pointed anthers open by pores or short slits. The ovary is three-celled, ripening into a three-celled capsule. Each whitish seed has a small, fleshy tail (the elaiosome) containing substances attractive to ants which distribute the seeds. The leaves die back a few weeks after the flowers have faded. Snowdrops contain an active substance called galantamine, (or galanthamine), which can be helpful in the treatment of Alzheimer's disease, though it is not a cure. The common double snowdrop, Galanthus nivalis f. pleniflorus 'Flore Pleno', had appeared by 1703, when it was illustrated in The Duchess of Beaufort's Book. It spread (and was spread) rapidly through northern Europe (by vegetative means, as it sets no seed). With 3–5 outer segments and 12–21 inners, which are often misshapen, the flowers may be less attractive to the eye of the purist than single-flowered or neater double cultivars, but they are good value in the garden as the bulbs spread rapidly and the large flowers show up well. There are numerous named cultivars of G. nivalis, single, semi-double, double and "poculiform" (meaning goblet or cup-shaped, this refers to flowers with inner segments that are almost the same shape and length as the outer ones). Apart from these traits they differ particularly in the size and markings of the flower and the period of flowering; other characteristics are less obvious to the untrained eye and are mainly of interest to "galanthophiles". In the UK and Ireland, many gardens open specially in February for visitors to admire the flowers. These displays may attract large numbers of sightseers. Some feature extensive displays of naturalised G. nivalis; others have more specialised collections of many species, forms and cultivars. 1. ^ Bishop, Matt; Aaron Davis, John Grimshaw (January 2002). SNOWDROPS A Monograph of Cultivated Galanthus. Griffin Press. pp. 10, 18 (Introduction). ISBN 0954191609.